Hello there! 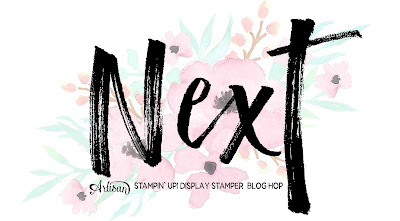 Welcome back to day 5 of the Stampin' Up! 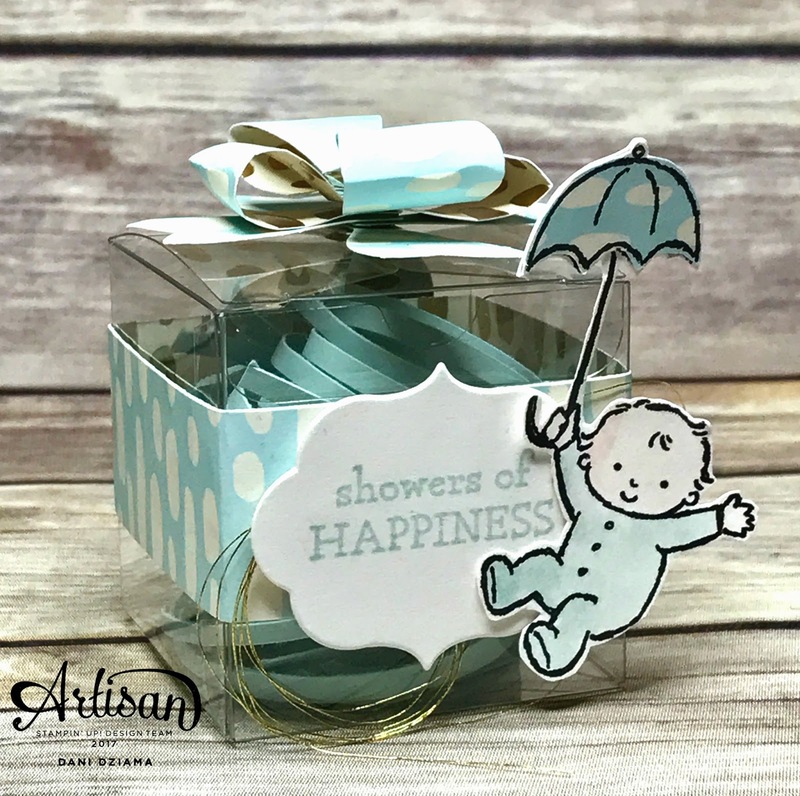 Artisan Design Team Display Stamper blog hop. I'm so happy you've joined us! As we are sharing our beautiful Display Stamper projects from all around the world- please be sure to download Google Translate so you don't miss out on any of the fabulous details! My projects for today are so sweet. ❤ They feature the brand new Bundle of Love Specialty Designer Series Paper. Earlier in the hop, I shared a few samples that were created using this DSP as well however those samples were using Blushing Bride. My samples today feature the Soft Sky/Vanilla paper. This paper is perfect for so many occasions. Especially for baby! It coordinates so well with the Moon Baby stamp set and various gold embellishments. As I wanted the moon to be the main focal point on this card, I used the Daffodil Delight re-inker and an Aquapainter to watercolor it in. I wanted it bold and bright and that's just how it came out! As you can see in the close up- this card has many different layers. 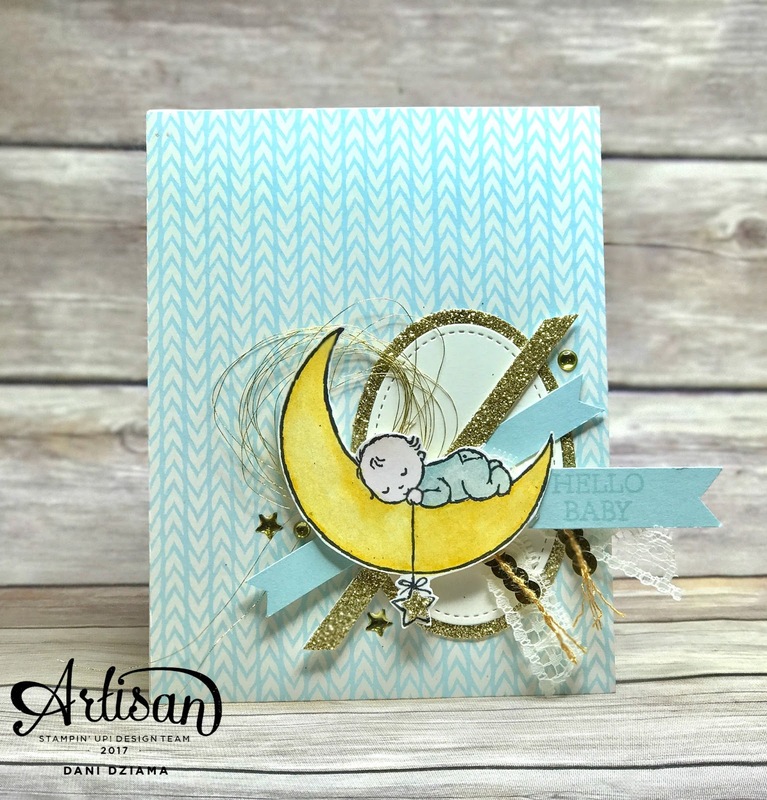 Lots of texture and dimension help make this card so sweet and oh so fun! The moon and the baby outfit were also colored in with the Clear Wink of Stella. It's a little difficult to see in the picture but they are super sparkly. 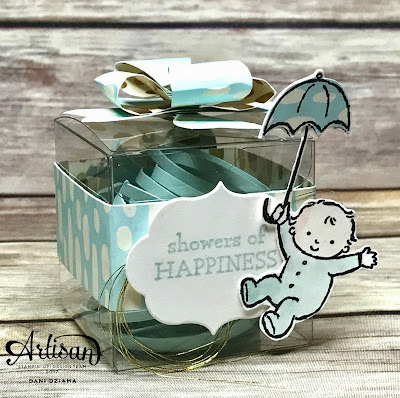 The second part of this set is an adorable little favor box that would be perfect for a baby shower. 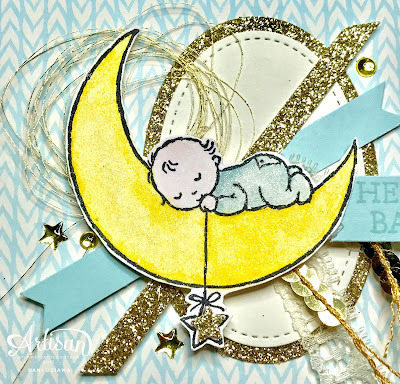 Once again- I've used the Moon Baby stamp set and the Bundle of Love Specialty DSP. To create the umbrella- I stamped the baby/umbrella image onto a coordinating piece of the Bundle of Love Specialty DSP and a Shimmer White scrap. Next, I fussy cut the umbrella. The umbrella was then adhered over the top of the baby/balloon image that was stamped onto Shimmer White card stock. The picture above shows the top view of the box. It's really cute in person and super simple to create! As the box needed to be light enough to adhere to the display board with velcro dots- I could only fill it with paper shred. It however would be adorable filled with baby themed candies. I hope you have enjoyed my projects for today! Be sure to check back tomorrow for more beautiful Display Stamper samples! Be sure to click the button below to see what the absolutely fabulous Jessica Winter has created for her display samples. Monday Montage #92 Wood Words SNEAK PEEK!